BALTIMORE (CNS) -- Father Jeffrey N. Steenson is finding that there are a lot of new roads to travel and new questions to resolve since his Jan. 1 appointment as head of the Houston-based Personal Ordinariate of the Chair of St. Peter for former Anglicans who want to become Catholics. The former Episcopal bishop of the Rio Grande, who was ordained a Catholic priest of the Archdiocese of Santa Fe, N.M., in February 2009, was to be installed in his new post Feb. 12. Also in February, a class of about 40 former Episcopal priests will begin an intensive, Internet-based course of studies to become Catholic priests within the ordinariate. Father Steenson and his wife, Debra, have three grown children and a grandson. Because he is married, he will not be ordained a bishop, but he will become a full voting member of the U.S. Conference of Catholic Bishops. He spoke to Catholic News Service during a busy day Jan. 22 at Mount Calvary Church in Baltimore, where he celebrated Mass, received a group of parishioners into the Catholic Church, performed a baptism and led an evensong service. Q: What do you see as the biggest challenges facing the ordinariate and yourself in the next months or years? A: We have to create a set of norms to govern it -- I'm not a canon lawyer, but the canon lawyers call it particular law. None of that exists yet so that's what we've been working overtime on for the last month, just to try and create that. So there's the practical question of getting the legal and business structure set up, and I've noticed that there are so many questions about the ordinariate -- about what it is, what its mission is -- that it's easy for people to misunderstand or draw wrong conclusions. Like, the Episcopalians shouldn't think we're sheep stealing because we could never contact an Episcopalian directly. The Catholic Church wonders, "Will you fit in or will you just be a separate entity?" So we have to show that we're going to keep our patrimony, our identity intact but we're a fully functioning part of the Catholic Church and we have deep respect for the ecumenical protocols whenever there are these awkward situations coming up. So I would say this is very, very difficult. (Laughs) God is really going to have to watch over us in all this. Q: Are there special challenges to governing a church jurisdiction that covers so large a geographical area? A: I'm sure there are going to be many, and it's primarily going to be for the clergy to be able to build relationships with each other. We're going to be virtual in so many respects. We're going to really depend on technology to keep communication open. Our formation program for the clergy is going to be run via a really high-tech Internet system that will allow real-time, two-way communications, which I'm told has never been attempted before in any kind of a theological exercise. So that will be hard, and I'm concerned that a small group -- I mean, this church (Mount Calvary) is not going to have any problems -- but a small group that is out in the middle of nowhere doesn't feel isolated and forgotten. So we will have to work really hard on that. A: I've talked to some of them. I've listened to many of the stories that have been told about their difficulties over the years. But in a way the Catholic Church today is in such a different place than it was in the early part of the 20th century. I've felt only a great sense of welcome from the Catholic bishops. And I hope -- I don't know how to put it, because I don't know enough about the history of Eastern Catholicism to be able to speak very knowledgeably about it -- but I don't want to see us living too separated of an existence from the Latin rite. For good theological and historical reasons too because that's where we came from. Whereas the Eastern-rite Catholics, they have a ritual identity that goes way, way, way back. And for Anglicans, I mean we're specifically not a ritual church; we're not recognized as a separate rite but we're part of the regular Roman rite using our Anglican patrimony. Q: Has the formation of the ordinariate given a new impetus or prompted a renewed interest in joining the Catholic Church among new groups of Episcopalians? A: Oh yes, there has been. Probably maybe 30 extra priests have contacted us at some level. It's not an easy journey, even the ordinariate, because the priest really has to be willing to make the journey to the Catholic Church and not just escape from his own. So it requires commitment and a lot of prayer to think through and a lot of sacrifices have to be made. And it's very hard to start all over again. So I do expect that it will grow, but my goal has been that as we form these guys they will be able to stand equally with their Latin Catholic counterparts, that they'll be as well formed and be able to function in the priesthood at the same level. Q: Why is the ordinariate needed when individual Episcopalians and even married Episcopal priests have been able to join the Catholic Church through other routes for years? A: When the apostolic constitution was published, there was an explanation written by (Jesuit) Father (Gianfranco) Ghirlanda, who's the canon lawyer at the Gregorian University, that's kind of the official commentary on it. And he answered that question by saying that the reason for the ordinariate is to guarantee the existence of the liturgical identity and patrimony. So whereas in the pastoral provision for an individual converting, they just kind of merge into the local Catholic culture, we're expected to keep this patrimony, these traditions alive, because the pope said there is something precious about them that is worthy to be shared with the rest of the Catholic Church. So Father Ghirlanda said the ordinariate is to guarantee the freedom to keep this liturgy alive. I mean liturgy in the broadest sense of the word -- the music, all that constitutes the Anglican tradition. Q: Why is the process different for groups of Anglicans than for individuals who want to become Catholic? A: Of course if it is an individual layperson they go through RCIA in their own parish. 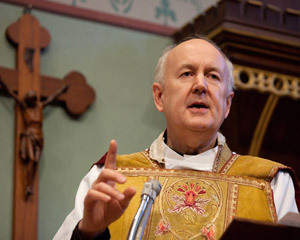 If it is an individual clergy person or priest, they would go through the pastoral provision which is administered by Bishop Kevin Vann in Fort Worth. And that will continue. The pastoral provision basically uses the same program of priestly formation that exists for the seminaries, only it's kind of tailored to an individual, so it's whatever Father So and So needs in order to do it. The way that has worked up to now is that the faculty of the Immaculate Conception Seminary in Seton Hall have provided the formation. They kind of evaluate where candidates are and tell them what they need. But for the ordinariate we'll be doing that on our own this spring and practically speaking the process is accelerated. ... It starts at the beginning of February and it goes into May, so it's basically one semester of intense work. Some people can't believe that that's possible, that you can make a priest that fast, but the Vatican has approved this process and asked for it to be expedited in this way because the assumption is that the clergymen coming in have already received pastoral, spiritual and human formation through their Anglican training, and we're just trying to address the differences in the intellectual formation, in the theology. So the formation program for the priests is essentially a comparative reading of the Catechism of the Catholic Church -- where does it differ from the Anglican theological tradition -- and to address those differences. Q: Some people have said it's not really fair, because married Catholic priests can't come back. How would you respond to that? A: It's kind of easy actually. That would be to compare apples and oranges. When we became priests in the Anglican Church, we became priests in an ecclesial tradition that permitted married clergy. So the Holy See is simply recognizing that and allowing us ... it's an ancient principle from the early church. Whatever stage of life you are in when you come into the ministry, that's where you stay. So if a man came as a celibate, he would be required to maintain that discipline. If one came as a married man, he would be expected to be a good husband. And if he should ever be widowed, then he would embrace the discipline of celibacy. It's not a new rule, it's basically the old Eastern discipline about married clergy. So, I don't want it to sound critical, but for those Catholic priests who left to get married and then want to come back again, that's a whole totally different question for them. And I don't think it is comparable to what the ordinariate is about. Q: As the only married member of the U.S. Conference of Catholic Bishops, what do you hope to bring to the discussions at national bishops' meetings and in the committees to which you are appointed? A: (Laughs) I can't even imagine. Well I was taught, in my days in the Episcopal House of Bishops, in those early days you were taught to be there, to be square and to keep your mouth shut. And I think I will have a lot to learn and I don't anticipate doing much talking. But a lot of relationship building, I think. I've been to two meetings of the bishops now and it's amazing to me that a business meeting is a business meeting, no matter what communion it's in. So some of it is pretty tedious. I think one of the differences I see, though, is that the unity that exists among the Catholic bishops is far greater than what I see among the Episcopal bishops. I was quite taken by that, you felt that there was just a greater consensus on important things. Plus the USCCB has (Cardinal-designate Timothy M.) Dolan -- I have never seen a man run a meeting so effectively as him. I'm astonished by how good he is. I've never seen anything like it, at any level. Q: Are there any particular issues that you plan to bring to the attention of the bishops because of your unique role? A: What we're going to need from the Catholic bishops is their cooperation and help with a lot of the practicalities, such as insurance, health insurance, all those things that we can't (do alone). It's impossible to actually go out and create a national health plan for the clergy. So in many of the practicalities, we hope that we can partner with the local dioceses. I also would like to see the men, the priests of the ordinariate, spend a lot of time with their counterparts in the Latin dioceses in terms of clergy meetings and gatherings, priests' conferences. My goal -- I don't know if it is going to be possible -- would be to see every priest in the ordinariate also have faculties in the local diocese. I know that is a grand goal to have. Because when Cardinal (William J.) Levada opened this up, that first press conference he had, ... he used the word "integration," not "absorption," because the idea is not to just be absorbed and lose your identity but to deeply integrate with the local diocese and so I would guess in terms of my relationships with the bishops, it's going to be aimed in that direction. And I want the men, my priests to have, one of the great joys of the priesthood is the fellowship with other priests. One of the surpassing joys of the priesthood is the life you get to share with other priests. And I don't want them to miss out on that. Q: Have you had an opportunity to meet the Holy Father? Will you be participating in the "ad limina" visits to Rome by the U.S. bishops this year? A: Sometime in the next five years I am going to do one. I have met the Holy Father but not as Pope Benedict. I met him as Cardinal Ratzinger in 1993 and I actually read a paper for him on this subject, receiving Anglicans. So I haven't met him since then. Since I've been a Catholic, I went to many papal things during that year. I met Cardinal (Tarcisio) Bertone, that was my principal high contact, and Cardinal Levada of course, but I haven't met the Holy Father as Holy Father. I can't wait. Q: If you had the opportunity, what would you say to the Holy Father? A: Thank you, first of all. This wouldn't have happened without him. This was not an idea that developed in one of the dicasteries of the Curia. This came right from the top and he had to convince a lot of people. So I feel that Pope Benedict put himself out on the line on this, and I want to be sure we don't let the Holy Father's words fall to the ground. I want him to be proud of us and see that we are making a fruitful contribution to the church. And the other thing I'd like to do if I could see him is to thank him for his Christology book that he wrote. It's sort of a life-changer for me -- "Jesus of Nazareth" 1 and 2. I'm a utility infielder at the seminary, in other words they throw me classes to teach when no one else can do it and last year I was given Christology. So the seminarians and I just read Pope Benedict, and it was an astonishing experience to do that. I think we all walked away from that experience in something of an awe for Benedict as a theologian. I'd like to thank him for that too. As a theologian I would say that in "Jesus of Nazareth" part 2, his chapter on Jesus in the Garden of Gethsemane is probably the most extraordinary piece of theology of our time. It's astonishingly adventuresome. I mean, he opens up doors that, I don't know, it just took my breath away. That's probably more than your readers would be interested in, but I would vote that chapter on Gethsemane as one of the most amazing pieces of theology done in our time. Q: Two of your sons have special needs. A: Yes, our two boys have Asperger's syndrome. They're adults now. One of them lives with us; he's employed by Walgreens, which has a phenomenal program for disabled adults. I'm amazed at Walgreens. That's Eric. And our other son, John, lives in Seattle, on his own, and he's a software engineer for Amazon.com. And we hold him up in prayer, more than once a day, to have our little boy out there on his own. ... We moved him out in July, so about half a year now. He loves his work there. He talks about Uncle Jeff, you know, the head of Amazon. He's been a very good employer. And then our daughter Kristina, she's a pediatric doctor in Traverse City, Mich., with her husband and our grandson, Peter. We're very proud of him. None of our children has come into the Catholic Church yet. All of them are very, very interested and I think the boys will come in relatively soon. ... Our children are all very strong Christians. Eric I think belongs to every young adult group in Houston, from Catholic to Baptist. He gets his social outreach through that; he's welcomed by Christian groups. Q: In light of the March for Life tomorrow, I know there are a lot of challenges with special-needs kids but also a lot of gifts that you get from them. I was wondering if you could talk about that a little bit. A: I remember when we got the diagnosis on Eric that he was autistic. It was obviously a pretty life-changing experience for us. And it was a Catholic nun, my first patristics teacher, she just appeared on the doorstep in Oxford -- Sister Agnes Cunningham, her name is, an amazing woman, she's the first woman president of the Catholic Theological Society of America -- and we were so down in the dumps about it and she walked in the door and said how God had chosen us for something special. And it was a total 180-degree attitude readjustment moment for us. And for parents that have special-needs kids, it's obviously very painful and difficult, but God never asks us to do something without giving us even more blessings. I just think if people offer up these challenges to God, they'll be astonished at what comes back.